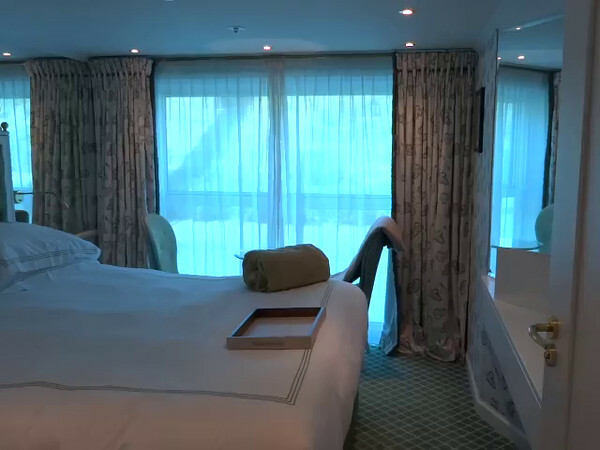 Here's a look at a middle deck Category 2 "French Balcony" stateroom (Category 3 is the same as this one)... as you'll see it's almost identical to the room we stayed in except that it doesn't have the separated "Solarium" area where the window opens. We loved our room as some mornings one of us were up before the other (or some afternoons only one of us took a nap) so you could go out, close the curtain and read a book, etc. without disturbing the beauty sleeper. :-) Either way these rooms are identical size to the top deck but if you like the separated feel and the better views (on this deck you're only 2-3 feet above the water so you don't see as well up over the River banks) move up to the top deck, Category 1 room.